Our premium model Blue Trunk Photo Booth is a unique and one of a kind photo booth. "A modern photo booth with a vintage twist" is the best way to describe it. This modern open concept style photo booth offers a very high quality and elegant vintage style. 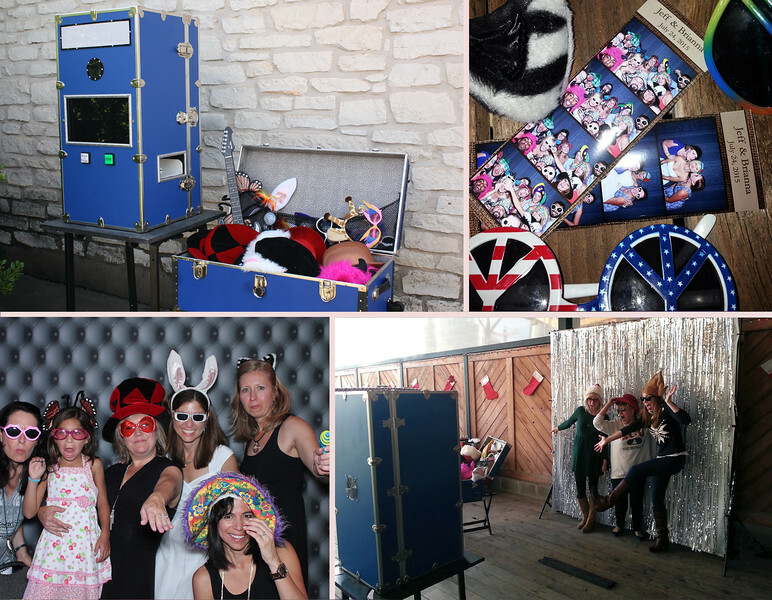 Our Blue Trunk Photo Booth is a one of a kind photo booth, only available through us. It was Created in house with high end professional photography equipment. Our focus is on quality while bringing a fun vintage feel to your event. This photobooth sets up in front of a backdrop, so the guests pose and have fun where everyone can see. This does keep the event lively, but offers less privacy. A lack of privacy does not seem to bother most guests, so it can be a really fun area to keep your eye on when in use. The camera, screen to preview poses, and touch screen with instructions are on the face of the booth. While the prints shoot out the side in just seconds. This booth allows guests fun filter options from high resolution to sepia, vintage and retro to black and white photos. Our Blue Trunk model is also versatile.... We can set it up in tight locations if you are short on space or spread out if you have the room. An 8x8 to 10x10 space is ideal, but we can shrink that down dramatically if we need to. You can also use no backdrop, a wall at your venue, or one of our curtain options. And as always Props are included... over 55-60 high end quality props come in a second trunk that opens to reveal the fun!!! Photos are timeless and the live entertainment provided on top of the printed keepsakes is guaranteed to make your event a hit. Keep your photo booth experience fun, exciting, elegant, and the best it can be with this really neat option!